Rebecca and Walt came to Florida this past weekend for their destination beach wedding. 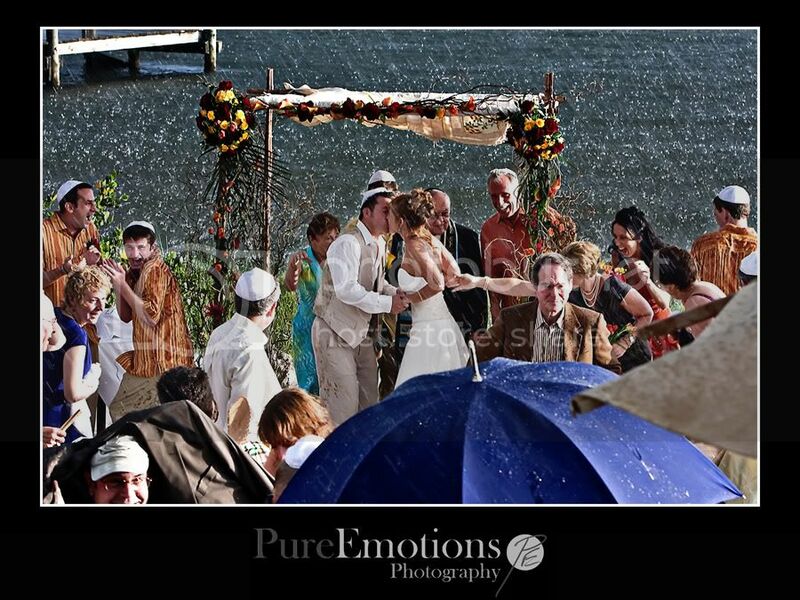 Unfortunately, it's been pouring buckets every day here for the past week and their wedding day was no exception. The ceremony was scheduled for 7pm. At 5pm it was storming and then cleared up so we thought that maybe we got lucky. But about 15 minutes before the ceremony began, it started thundering and lightning. Rebecca and Walt decided to get married out by the water, rain or shine so off we went. For the first 10 minutes, the rain held off but the thunder roared. More than 100 guests came in from all over the place to witness the ceremony and union of these two incredible people. Midway through the ceremony, the rain began to come down, first in a light drizzle but then it poured! Everyone was completely soaked but nobody left. Everyone stayed and watched as Rebecca and Walt shared their first kiss as husband and wife. Everyone clapped and laughed and was filled with joy even as they were being drenched. It truly was an amazing experience and one that will never be forgotten. For about an hour afterwards, many people walked around in towels (luckily their wedding was at the beach area of a hotel and there were plenty of pool towels that they brought and gave to the guests. Just one photo for now... the shot we waited in the pouring down rain, risking our camera gear to capture. More photos coming later! A little rain did not spoil a beautiful wedding! This is one wedding that will not be forgotten. Alicia you did an incredible job capturing the love between Walt and Rebecca. Can't wait to see the other photos! Hugs! It will definitely be a memorable wedding for everyone who was there! And hey, they got treated to a true Florida experience. THIS PICTURE IS AWESOME. Really awesome. I can see it becoming a classic that you would see all over the place. I can't wait to see the rest! Wow! Pretty spectacular! This will be on they look back on for sure. So many different reactions and things going on. Looks like a fun wedding! A memory for sure! Look at that rain coming down! What a fun and crazy thing to happen on a wedding day. That is great that you were able to snag a shot like that! I am sure the couple will love the photo that completely captured the action and emotion from their wedding day!